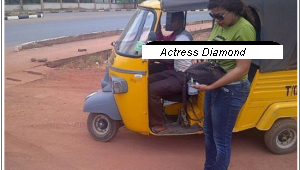 Beautiful talented actress Adaeze Igwe Diamond was spotted highlighting from a commercial tricycle popularly know as a Keke Napep. What could run in your minds now peeps? The Ebonyi State screen diva who made her first debut with Government House Drama in 2004, has featured in more than 80 movies till date, with her stylish ways of interpreting roles on screen she has won the delight of most Nollywood Movie lovers..